↑ "International Security Assistance Force (ISAF): Key Facts and Figures" (PDF). ISAF. 2010-07-06. Retrieved ۲۰۱۰-۰۸-۰۶. ↑ Bajoria, Jayshree (2009-10-26). "نسل جدید ترورسیت‌های پاکستانی". Council on Foreign relations. Retrieved ۲۰۱۰-۰۴-۰۶. ↑ "Pakistan Observer – Newspaper online edition – Article". Pakobserver.net. 2009-07-30. Retrieved ۲۰۱۰-۰۲-۰۹. ↑ "While U.S. debates Afghanistan policy, Taliban beefs up". Mcclatchydc.com. 2009-10-14. Retrieved ۲۰۱۰-۰۲-۰۹. ↑ Morello, Carol; Loeb, Vernon (6 دسامبر 2001). "Friendly fire kills 3 GIs". Post-gazette.com. Retrieved October 2, 2008. 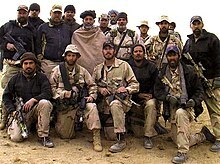 ↑ Terry McCarthy/Kunduz (18 نوامبر 2001). "A Volatile State of Siege After a Taliban Ambush – Printout – TIME". Time.com. Retrieved October 2, 2008. ↑ John Pike (2001-12-09). "VOA News Report". Globalsecurity.org. Retrieved ۲۰۱۰-۰۲-۰۹. ↑ "OEF: Afghanistan: Fatalities By Year". iCasualties. 2005-09-09. Retrieved ۲۰۱۰-۰۸-۲۴. ↑ "Defenselink Casualty Report ۲۰۱۰-۰۷-۰۲" (PDF). Defenselink. 2010-08-02. Retrieved ۲۰۱۰-۰۸-۰۲. ↑ "Contractor deaths in outsourced U.S. wars reach 1,000". The China Post. 2007-07-05. Retrieved ۲۰۱۰-۰۲-۰۹. ↑ نفیض مصدق احمد (اکتبر 2009). "تروریستهای ما". New Internationalist. Retrieved ۲۰۰۹-۱۲-۰۷. ↑ "جرج بوش درخواست طالبان برای تحویل دادن طالبان را رد کرد". Guardian Unlimited. London. اکتبر 14, 2001. Retrieved مارس ۸, ۲۰۰۷. کریستوفر ان. کونتز, ed. (2008). سایت آرمی هیستوری صداهای بادوام: صداهایی از داستان‌های سربازان ایالات متحده در طول جنگ در افغانستان Check |url= value (help). واشینگتن دی‌سی: مرکز تاریخ بخش نظامی ایالات متحده امریکا. CMH Pub ۷۰-۱۱۲-۱. تمام موضوع به صورت آنلاین در دسترس می‌باشد.